Trade caravans bring precious spices across the desert from southern Arabia. Arabia, a region of flourishing civilization and desert nomads. Arabian civilization reaches a height of prosperity. The civilization of southern Arabia is in decline. The civilization of southern Arabia has declined, along with the great desert trade routes. Arabia has become the springboard for dramatic conquests under the banner of a new religion, Islam. Arabia is home to Islamic sects seen as dangerous by the orthodox Muslims. Yemen has been a centre of trade and Islamic culture. 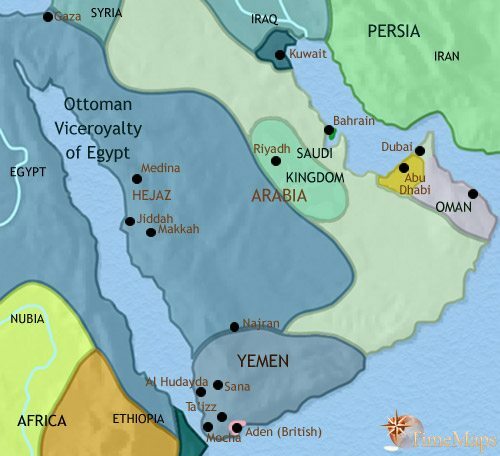 The Ottoman empire is the dominant power within the Arabian peninsula. The first Saudi kingdom has appeared in Arabia. The first Saudi kingdom has been crushed, but a second one has appeared. The second Saudi kingdom has fallen. A third, much larger, Saudi kingdom has appeared. Oil is bringing vast new wealth to the Arabian kingdoms. The region experienced a huge shock when Iraq invaded Kuwait. 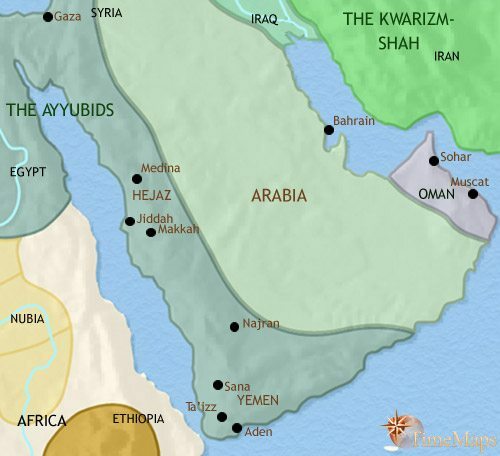 The kingdoms of southern Arabia have continued to flourish. The well-organized irrigation systems, crucial to the agriculture of the region and the economic well-being of the population, are kept in good repair and continue to expand. The trade in frankincense and myrrh also continues to expand. Towns have also appeared further north, along the trade routes heading north to Mesopotamia and Syria. The nomadic tribes of the desert profit from this trade through dues levied on the caravans. 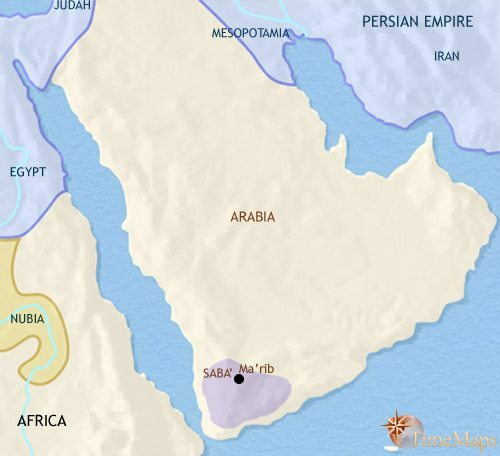 Up until around this date, most of Arabia has been entirely uninhabited. Nomadic groups live on the margins, where grasslands allow their herds of sheep and goats to graze, but the barren interior has not allowed any peoples to establish a foothold. At around this time, however, the camel is domesticated. These hardy animals allow nomads to travel long distances in the desert. Trade routes across the Arabian peninsular begin to be pioneered, and oases begin to be populated. The classic “bedouin” lifestyle begins to take shape. Perhaps related to these developments, a new civilization is emerging in south west Arabia, based on large-scale irrigation systems which bring the dry but fertile soil of the region to life. The peninsula is home to Arab nomads, living a life which would be recognizable to modern Bedouin. The exception to this is in the south, with its settled kingdoms and cities. These well-organized states, the most notable of which is the kingdom of Saba, are home to a civilization which is dependent upon large-scale irrigation to sustain its agriculture. They also benefit from the production of frankincense and myrrh, highly prized throughout the ancient world for their fragrance and preservative qualities. The kingdoms of southern Arabia continue to thrive as their cities take a central part in the expanding incense trade. Indeed, this period probably sees the height of southern Arabian prosperity in ancient times, with the irrigation systems at its most productive and the overland trade in myrrh and frankincense at its most flourishing. 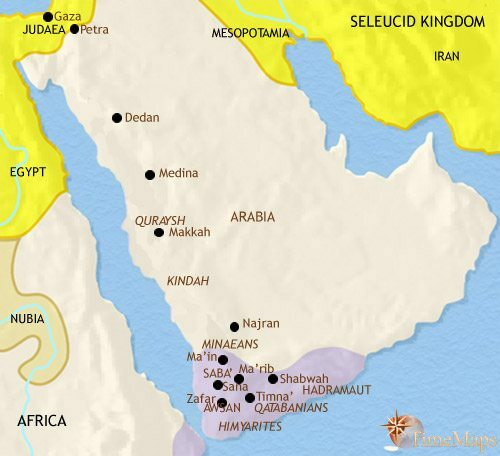 Greek and Roman traders are in direct contact with the producers of south Arabia, as they are with the trading cities further north, where the Nabatean kingdom rules. The material culture of the region is increasingly influenced by classical Mediterranean models, and it is at this period that the beautiful city of Petra, in modern Jordan, is adorned with its marvellous rock-carved temples, which are some of the most outstanding examples of Hellenistic architecture. In the Arabian interior the nomadic tribes continue to profit from the trading caravans passing through their lands. During the first century CE Greek sailors pioneered the Indian Ocean trade routes, using the Monsoon winds to take their sailing ships to and from the subcontinent. Abundant archaeological evidence in India points to the extent of this trade. Unfortunately for the towns and kingdoms of southern Arabia, the Greek merchant ships could by-pass the southern Arabian kingdoms in a way that camel caravans could not, and as this maritime trade gathers pace, the slower and more expensive overland routes have declined. With the decline of the overland trade has come a decline in the fortunes of the southern Arabian kingdoms as well as the desert nomads. These latter are now occupying large areas of previously fertile farmland as the centuries-old irrigation systems become degraded. In the north, the Nabatean kingdom has been annexed to the Roman empire. The control of the lucrative maritime trade is now in the hands of the kingdom of Axum, in modern Ethiopian, and the southern Arabian civilization has declined with the fall off in overland traffic up the peninsula. The once-extensive irrigation systems have become badly degraded, with sometimes calamitous effects: there is evidence for dam collapses and destructive floods affecting some of the most populous centres of population. Nomadic herders now graze their flocks where once was fertile agriculture. 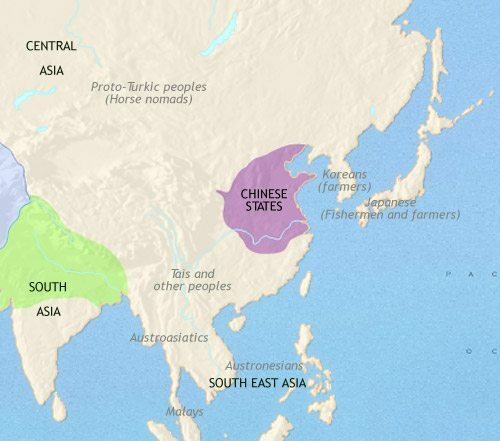 The decline in the overland trade seems to have led to a rise in warfare between the nomadic tribes of the interior. Commerce has not completely disappeared from the peninsula, however. Some towns in western Arabia continue to be centres of trade. One such is the town of Mecca, which, with its enormous black stone, regarded with religious awe by the pagan tribes, is also a centre of pilgrimage. 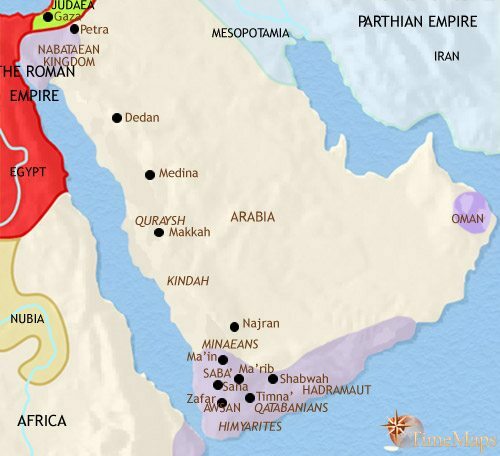 To the north, both large empires, Roman and Persian, pay Arab rulers – the Ghazanids for Rome and the Lakhmids for Persia – to act as buffer-states between the desert nomads and the settled areas of the empires. The Arab buffer states of the Ghazanids and the Lakhmids both fell foul of suspicions of treachery by their respective patrons, the Byzantine and Persian emperors. 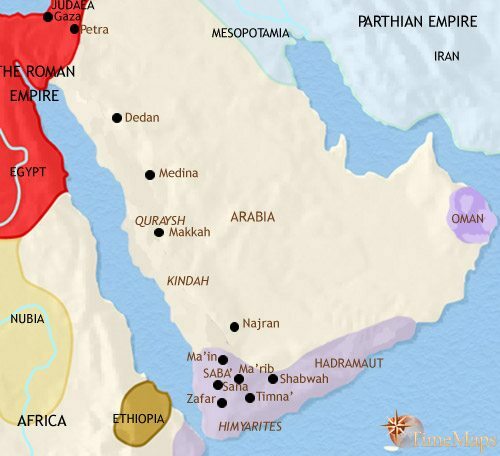 This had the effect of making the borders of the two empires open to attack by nomadic Arab tribes. Meanwhile the preaching of a prophet called Muhammad in the towns of Mecca and Medina brought about a religious revolution. It gave rise to a new religion, Islam, and led to the great Arab conquests of the mid-7th century which created a huge new empire, the Caliphate. 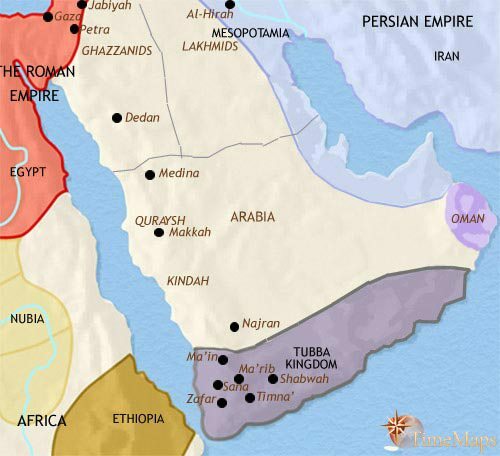 In the wake of these conquests, many Arabs migrated, either as individual families or as whole tribes, to the conquered lands, where they would contribute to the process of Arabization and Islamization. 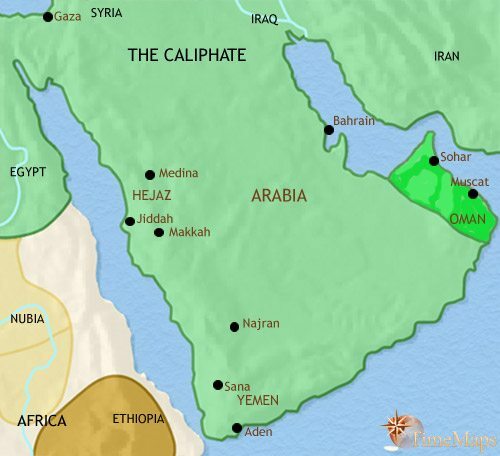 Arabia itself, however, lost its central political importance when Damascus, in Syria, became the seat of the Caliphate. Mecca and Medina remained the most holy cities of the Islamic world, and major centres of pilgrimage. Successive caliphs lavished new mosques and monuments on them. 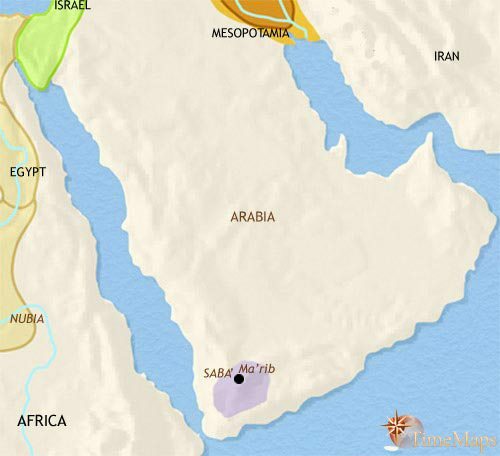 Arabia soon became a haven for branches of Islam considered heretical by orthodox Muslims. The first of these were the Ibadites, who believed that the caliph should be elected. One of their leaders took control of Oman and rules there with the title of Imam. From 870, Yemen became virtually independent under a line of hereditary governors. These gave way to a succession of independent dynasties ruling in that area, often more than one at the same time and representing different sects. These only loosely acknowledged the overlordship of the caliph, if at all. Mecca and Medina have also come under the control of local dynasts, the Alid family – whose dominance will last for a thousand years. At times they will be forced to accept the overlordship of one distant power or another, but the local affairs of these cities will be in their hands. As for the Bedouin tribes in the interior, they have effectively resumed their age-old independence, fighting one another for control of water holes, oases and trade routes. Many have become adherence of a radical Islamic sect called the Qarmatians. These believe that all Muslims – whether nomads, merchants, farmers or officials – should live as equals, an ideology that fits well with the nomadic lifestyle. In 930 they attack Mecca itself. The military power of the Qarmatian tribes was suppressed by local Sunni tribes in the late 11th century. The Bedouin peoples of the desert retain their de facto independence from all external authority, however. The Ayyubids of Egypt invaded Yemen in 1173 and established their dominance there. Oman was ruled by the Seljuqs for about a century, but has been independent since c.1154. The country is now ruled by a succession of Imams, at the head of a loose confederation of tribes. Coastal Oman has become a major centre of the Indian Ocean trade. Omani sailors and merchants routinely voyage to India and East Africa, and even as far as South East Asia. In all these places they are active in spreading their Muslim faith, which thus spreads far beyond its Middle Eastern homeland. An Ayyubid governor of Yemen established his independence in 1229, and founded the Rasulid dynasty. The Rasulids were active patrons of Islamic art and learning, and under them Yemen became a major centre of Muslim culture. Their stable rule encouraged trade to pass through Yemen, and it prospered as a result. However, by the mid-15th century the Rasulids have fallen into decline, and Yemen has come under the overlordship of the Mamluqs. The decline of Yemen has led to to the resurgence of Oman as the Arabian centre of the Indian Ocean trade. In the Hejaz, the region of Mecca and Medina, the ruling Alid family have also come under the control of the Mamluqs. In 1517, the Ottomans had come in from the west, bringing the Hejaz, with the Holy Cities of Mecca and Medina, under their control (though leaving local rulers, such as the Ali dynasty in the Hejaz, largely free to govern as their liked). This inaugurated a period of prosperity for the Holy Cities of Mecca and Medina, protected as they were by the Ottoman empire and with imperial patronage lavished on them. 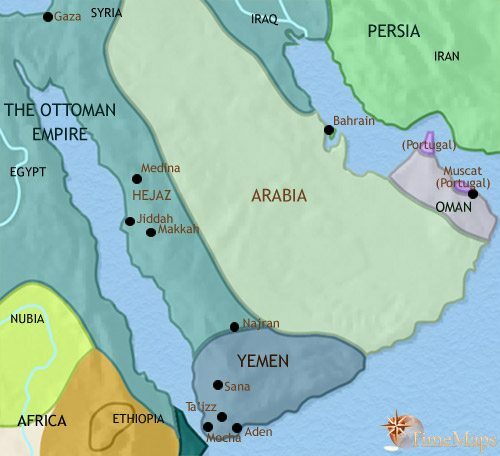 Yemen also came under Ottoman rule, but the latter were driven out in 1635. The Portuguese were active in the Gulf from the start of the 16th century, capturing Hormuz and Muscat in 1507, and Bahrain in 1521. After the Ottomans had conquered Iraq in the 1530s, they too became began operations in the Gulf. Coming into conflict with the Portuguese, they ousted from Bahrain in 1602. The Portuguese were also expelled from Muscat by a local religious movement, whose leader founded the Yarubid dynasty of Oman. The Omanis then harried Portuguese shipping and bases along the east coast of Africa, considerably weakening their power. Oman won control of the Indian Ocean coast of East Africa as far as Zanzibar. However, internal instability led to a Persian invasion in 1737, and Omani maritime influence dwindled. The Omanis drove the Persians out again in 1749, under the leadership of Ahmad ibn Sa’id, who established the Sa’id dynasty. The 18th century has seen other small states appearing along the Gulf coast, often by clans moving to the coast from the interior: Kuwait (1756), which has become a thriving trading community, Qatar (1766) and Bahrain (1783). Other small Arab sheikdoms along the Gulf coast have a long tradition of piracy, and this area has became known as the “Pirate coast” to Europeans. Other European merchants and sailors have begun operating around the coast of Arabia. The British East India Company is especially active, and has began entering into commercial treaties with coastal sheikhs. 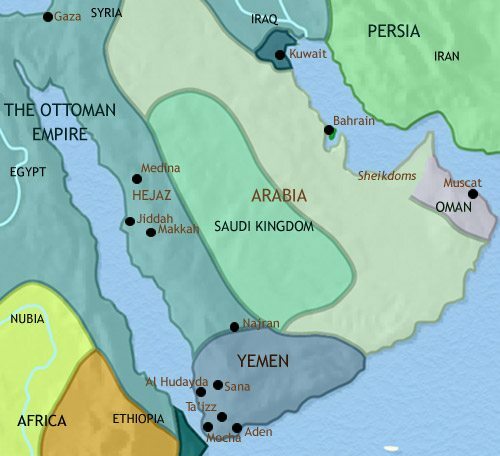 The interior of the Arabian peninsula has seen the foundation of the Wahhabi movement, in the mid-18th century. This sect espouses a radical conservative version of Islam. Its founder forged a close alliance with a minor chiefly family called the Sauds, and together they have won an extensive kingdom in central Arabia. In 1806 the Wahhabi movement, headed by the Saud family, captured Mecca. This prompted Muhammed Ali, the Ottoman viceroy of Egypt, to invade the Arabian peninsula in strength. He recaptured Mecca, drove the Wahhabis back into the desert, captured their capital of Riyadh, and executed the Saudi leader. In 1824, however, another Saudi leader recaptured Riyadh and founded a new Wahhabi kingdom. The British naval ships have clashed increasingly with Arab pirates in the Gulf. To combat this nuisance, and also to promote their commercial interests, the British extended their influence along the Gulf coast by signing treaties with the ruling sheiks, including Bahrain in 1820 and the Qawasim emirs in 1835. Meanwhile, Oman, now united and stable under its Sa’id sultans, has reasserted its control over its East African dependencies, as far south as Zanzibar. The Saudi-led Wahhabi kingdom soon descended into chaos in fratricidal fighting within the ruling family, allowing another family, the al-Rasheeds, to rise to power. These captured the Saudi capital of Riyadh, and conquered a large in northern Arabia. In Yemen, the British captured the port of Aden in 1839, as a base from which to protect shipping from pirates. The British have also persuaded the Ottomans and the Gulf sheikdoms to help them suppress the Indian Ocean slave trade. With a view to this, as well as to combat piracy and promote trade, the British have entered into more, and tighter, treaty relationships with the coastal sheikdoms of the Gulf. Since 1861 the sheikdom of Bahrain has been a British protectorate. In 1856 the Omani empire was divided between two brothers, with one ruling from Zanzibar, on the East African coast, and other ruling from Oman. In Oman, the ruling family’s preoccupation with maritime interests had loosened their ties with the inland tribes, and these became increasingly restive. The ruling family forged close links with the British, who have supported them in their attempts to control the interior of the country. In northern Arabia, the al-Rasheeds became pre-occupied by a struggle with the sheikdom of Kuwait, and this allowed the Saudis to recapture their old capital, Riyadh, and much of their earlier territory. In the 1880’s, having tightened their control over Iraq, Ottoman forces conquered down into the Arabian peninsula, as far as south as Qatar. Threats to bring Kuwait under direct rule by Ottoman officials caused the small state to cultivate close ties with Britain. In 1892, a group of small emirates further south along the Gulf coast became protectorates of British, and became known as the Trucial States. In Oman, continuing friction between the coastal ruling class and the interior tribes has been ended (for the time being) by a peace agreement, brokered by the British. This has confirmed the sultan’s sovereignty over the entire country, but given the inland tribes a large measure of autonomy. Since the opening of the Suez Canal, the British port of Aden has acquired much greater strategic importance, both as a naval base (the British navy uses it as a coaling station) and as a trading port. The British have safeguarded Aden’s security through alliances with local Yemeni rulers. With the outbreak of World War 1, Kuwait became a British protectorate, to safeguard it from an Ottoman invasion. 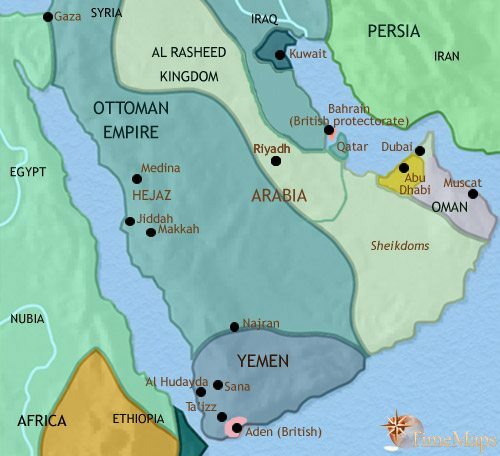 The Hejaz drove the Ottomans out, with British support (notably under “Lawrence of Arabia”); and the Saudis fought the pro-Ottoman al-Rasheeds. 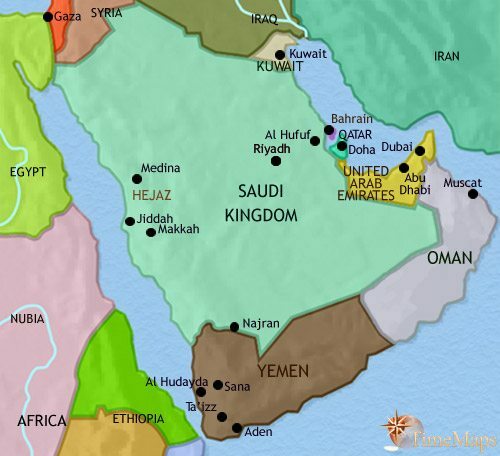 In the years after the war, the Saudis occupied all of what would become Saudi Arabia. The combination of tact and toughness which Ibn Saud, the Saudi king, displayed towards both the Bedouin clans and the sophisticated urban elites of the Hejaz cities, established his enormous kingdom on firm foundations. The region has experienced decades of peace and stability. In the 1930’s the discovery of vast deposits of oil, exploited by American and British companies, brought new levels of prosperity; in some cases, sleepy little emirates became wealthy modern states in the space of one generation. An insurrection in Oman, by the tribes of the interior (1954-60), was put down with British help. The British staged a withdrawal from the region in the 1960’s and early 70’s: Kuwait (1961), Aden (1967), and Bahrain, Qatar and the Trucial States, now the United Arab Emirates (1970-1). Revenues from the oil industry, already vast, greatly increased after 1974, when the oil-producing countries renegotiated the oil price after the West’s support for Israel. The industry has brought in hundreds of thousands of workers from all over the world, but particularly from South Asia. In Oman, the traditional hostility between interior and coast led to another revolt in the early 1960’s. The sultan was able to put this down with support from his neighbours. The region experienced a huge shock when Iraq invaded Kuwait in 1990. The Iraqis were ejected by a massive international invasion, led by the USA and Saudi Arabia, launched from bases in Saudi Arabia and the Gulf states. Despite the shock, the Iraqi invasion no more than interrupted economic progress. However, a threat to the stability of several Gulf states remains: the majority of their populations are Shi’ites, whereas their rulers are Sunnis. With the rise of a militant Shi’ite Iran after 1979 this has made this religious divide a source of anxiety.